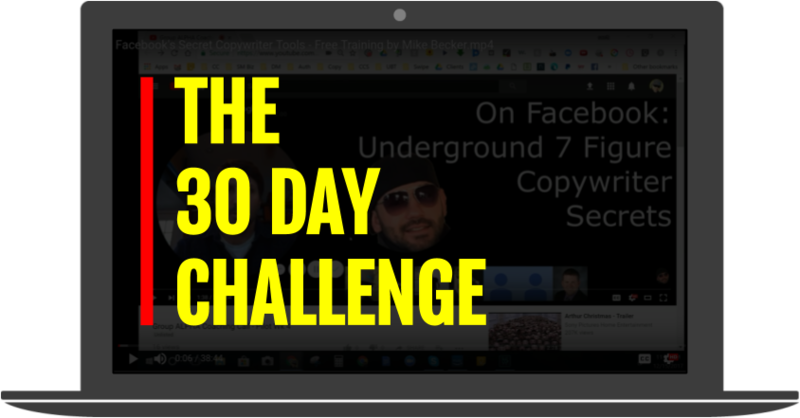 The 30 Day Challenge is THE copywriting Game Changer for your copy business… and not just because it produces radical results fast. You see, the 30-Day Challenge helps spark an irreversible groundswell of MOMENTUM… something your copywriting business will die without. Than the majority of hacks accomplish in 3 years of copywriting. If you want to get RESULTS right the hell NOW. Well, then what you need… is a radically challenging mission. And that’s why you’re going to have a very intimate relationship with The 30 Day Challenge. You’ll hate it a little… and love it a lot. Because it will challenge you OUT of your comfort zone… to where the REAL money is made. This series of 5-10 minute power-packed videos will grab you by the scruff of your copywriting neck… and propel you to results you thought were reserved for the A-Listers alone. $10 Discount for 1st 5 buyers only!! Only for 1st 5 buyers!!! There are 2 versions of this available, we have the lowest one. Hi. Just to be clear. It's $15 +PayPal Fees for ALL 6 modules noted above. But this off does NOT include: the two bonuses and challenges ... or are those included, but not the 7 new videos each week? Please clarify exactly which elements of the offer -- as shown above in post #1 -- are included in this group buy. A PM with details has been sent!!! I replied to PM but not seeing it in my sent file. Anyway, please send the PayPal link. Also, how long before delivery of files? Thanks! Last edited by MandyZ; 02-02-2019 at 09:20 PM. Thanks for the email update. I've PMd you my email address as requested for the product links links. And fixed the PP ID #. Please send the GoogleDocs version too if the product file is bigger than 3GB. Thanks! Mike is partnering up with Jake Hoffberg and they are going to make Sales Alchemist, perhaps we can organize a group buy for there.